In developed countries the threat of contracting Ebola from food sources is null, but in areas of Africa it is a real threat. Throughout late 2014 and early 2015, Ebola was widely publicized as the virus moved from Africa to the United States although Ebola has been a constant problem in Africa for years. Ebola is a virus that is generally spread by direct contact with body fluids or blood of an infected person, but in Africa it may also be spread while consuming, hunting or preparing Bushmeat. Bushmeat is an umbrella term that groups together meat from wild animals such as bats, antelope, rats, monkeys and other nonhuman primates.The main reservoir of the virus appears to be fruit bats. It is either through the consumption of fruit bats, or cross contamination between fruit bat droppings and other bushmeat animals that causes Ebola to be transmitted through food. Bushmeats are main sources of food for some and often seen a treat for others at markets and roadside stands. These types of meats are usually dried, salted or smoked in the open African heat alongside other butchered animals. This is a breeding ground for other bacteria and cross contamination can easily occur with other bacteria of concern such as E. Coli and Salmonella. The consequences of Ebola are high, one strain tied back to fruit bats in the Congo area found that 40% of infected patients died. Ebola causes hemorrhagic fever, headaches and can result in death. Ebola can be destroyed by heating to 60 degree Celsius for 60 minutes or at higher temperatures of 72-80 degrees Celsius for 30 minutes according to the CDC. While heating Ebola has been found to inactivate and destroy the virus there is still the issue of cross contamination, as seen in the following picture the spaces used to cook and prepare the meat appear unhygienic and less than ideal. It is also difficult to know if the meats have been cooked to the proper temperatures as most would not have access to thermometers. The ones that are at highest risk of contracting the virus from animals are those who are hunting and gathering these animals as many are bitten or scratched or come in contact with blood during these processes. The likelihood of contracting the disease from human contact is much higher than from bushmeats. Hundreds of thousands of varying types of bushmeat are consumed annually throughout Africa and this will likely continue as it is a source of nutrition and part of their culture. It is recommended that steps be taken while hunting and gathering to reduce infection such as avoiding blood and fluids from animals, wearing gloves, not consuming predeceased animals and keeping raw foods away from cooked. These steps will not eradicate all cases of Ebola in Africa but it may help decrease the amount of outbreaks. If you would like to learn more please watch the video below. Hi Tamara, I did not expect that ebola would be termed as a food-borne pathogen, but thinking about it, it is!. The main source of disease infection I heard from news was that Africans eat raw bat meats and drink their blood, and this is their cultural practice of diet. Also, when people die of ebola, Africans contact with the dead body which is also a part of their funeral culture.. I think such cultural factors have been risk factors for the transmission of ebola. I wonder though, why ebola has occured just recently, when such cultural practices were still done in the past. Its interesting to hear that the original source of Ebola is from animals. Over the past year or so, all we’ve been hearing about in the news is how infectious it is between humans ignoring the fact that the initial contamination is from something we may consume. Although these types of foods are not commonly consumed here in North America, with all the travel and trade it has become of major concern. Its funny that we have only recently started hearing about Ebola issues when this has been going on in Africa for many years. However, only recently when people in North America and Europe have become infected is when this issue has been brought to the news. This is an interesting article. This term I am taking a virology course and currently we are discussing about the Ebola virus (EBOV). Relating to this article, the 2014 EBOV epidemic is actually initiated due to the consumption of bats, as bats are asymptomatic of EBOV. Fortunately for us, vaccines are available now for EBOV (and it was initially designed by the National Microbiology Lab of Canada in Winnipeg. YEAHHHH). This vaccine is under review now and it has shown great efficacy against EBOV infection. Furthermore, this vaccine can be mass produced by engineering tobacco plants so that it can be produced on site in African. Personally, I do not think EBOV should be considered as a foodborne pathogen. 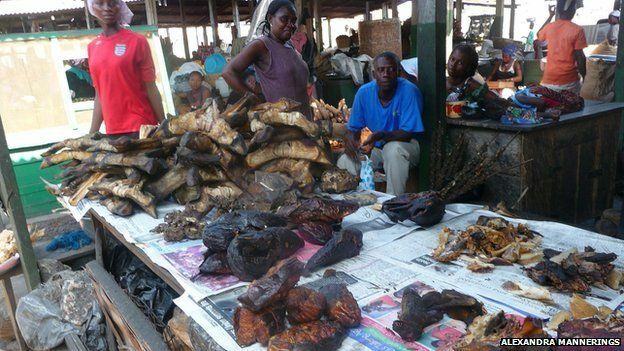 Although the infection of native African population by EBOV is due to the consumption of bushmeat, bushmeat is not a common source of food for them. They eat it because they do not have other food choices. It is interesting to know that Ebola is originated from animal source. Places like Africa where most people live in poverty and food supply is limited, they have no choice but to eat Bushmeat which contains microbes or viruses that have never been encountered by the human population. Even though the source of the virus is identified, becasue of poverty and the brutal environment it is difficult to stop the people from hunting other bushmeat. And this might causes another outbreak of foodborne diease in the future due to the consumption of asymptomatic bushmeat. I was quite shocked to know Ebola can be considered as food pathogens. The horrifying Ebola outbreaks in Africa and America earlier this year did attract a lot of public attention, and not many news mentioned how to prevent Ebola at household level. It is good to know that Ebola can be destroyed by heating, which means it shares the same food safety practice with many other foodborne pathogens. We should always be prepared to fight with foodborne pathogens and be aware of the horrible consequence of incorrect food handling. As Ebola is generally known to spread through direct contact with infected blood and body fluids, it is quite interesting that it can be regarded as a food-borne pathogen. Through the image and the video, it can really be seen that there is immense potential for contamination through the various steps of preparation, cooking, and consumption of bushmeats. While the virus can be eliminated through heat processing of the food, it may be still be a great challenge to regulate hunting and gathering practices to reduce risk of outbreaks. This is a very interesting post. It change the mainstream view that Ebola virus is transmitted by human infected blood and body fluid. The fact that the Ebola virus can be destroyed by heat is a wonderful fact to know and hopefully this fact would be helpful in preparing the bushmeats. However, in area such as Africa there may not be enough resources to implement regulations that the hunters, gathers, and street vendors to follow to reduce and prevent the outbreaks. 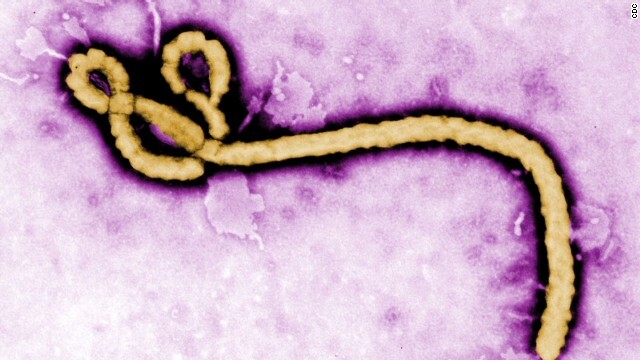 Ebola as a foodborne pathogen really caught my eyes to this post! I never thought it could be transmitted through food since the news only emphasize on direct contact with blood. The fact that how they are selling the bushmeats in the market of course is the main reason for cross contamination but i think the utensils they use to prepare the meat is also one of the reasons for cross contamination. I think the reason why Ebola is that savage is also due to people consuming bushmeats on a daily basis. In this case, Ebola can be spread widely in Africa. I remember back in 2014 when we first heard about the ebola outbreak, and this catalysed the kicking in of many survellience agencies across the globe. Your view is that the cultural practises in Africa may help spread Ebola, but other countries that don’t sell bush meet or don’t have customary funeral practises, still seem to have been concerned for the spread of outbreak. Is ebola as viable outside Africa?